Feb 08, 2017: I can finally join you guys! Here is my simple, LED, odorless spacebucket. May 30, 2017: Good 600 watt light timer? Sep 01, 2017: First Time grower some questions. Sep 14, 2017: My 44gal Brute Build! Oct 08, 2017: Green algae won't go away..
Sep 14, 2018: Solutions for keeping room dark at night but light in the day? 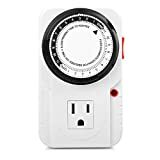 Nov 19, 2018: Plugging a small space heater into a timer outlet overnight, safe?